Did you know there’s a single spot on your brain that recognizes numbers? Or that the first computer bugs were actual insects and that most of the internet is under water? 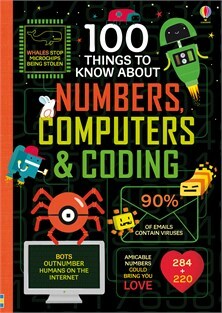 This fascinating book is filled with 100 fascinating facts, bright, infographic illustrations, a glossary and index, and links to specially selected websites to find out more. There is enough in it to build a lesson a day for almost an entire school year and that doesn't include the offshoot investigations that would take you off on a tangent! I can envisage those eight-year-olds of 30 years ago pouring over it!